To me it's impossible to write about Mind Spiders without bringing up Mark Ryan's past band The Marked Men. It's also difficult to not compare Mind Spiders in some way to the band Radioactivity (which Ryan is also a part of). While Radioactivity has become the more logical evolution of The Marked Men's brash and poppy rock and roll, Mind Spiders have been morphing into something else completely and that is no more evident than it is on Prosthesis. Now, there are still hints of the Marked Men, and for sure that is what keeps drawing me back to this band time after time. There's some sneaky hooks hidden in the songs along with some big, chunky power chords that occasionally rear their heads. But at its essence, Prosthesis is a completely different type of band. They're kind of quirky, with stuttering rhythms like a truly bummed out Devo. There's liberal use of synth (usually the kiss of death for me), but they're not used in a way that seems frivolous or gimmicky. The keyboards here really add to the texture of these songs, giving them a darker feel. Do I like Mind Spiders as much as I like The Marked Men or Radioactivity? No I don't. 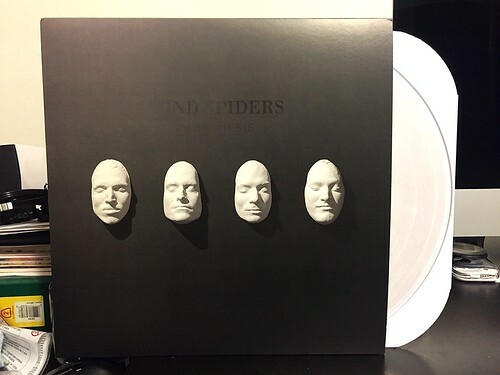 But it's such an unfair comparison as Mind Spiders are really forging their own way and creating some unique and interesting sounds. I don't listen to a lot of bands that go down this path, but the ones that I do listen to all do it exceptionally well. Mind Spiders absolutely fit in that category. After all, I don't typically buy four full length albums by a band that I don't like. Make It Plain / Deep Pockets - Split 7"